With four weeks left in the regular season, it’s looking like the race for PFF’s Rookie of the Year award is going to be a tight one down the stretch. Jumping straight to business this week, the top-25 rookies can be found below. Ward ranks 11th out of 128 cornerbacks who’ve been on the field for at least 150 defensive snaps so far this season in terms of overall grade, and his 84.8 coverage grade ranks sixth. The fourth overall pick is tied for 17th among corners with 10 defensive stops in coverage this season. 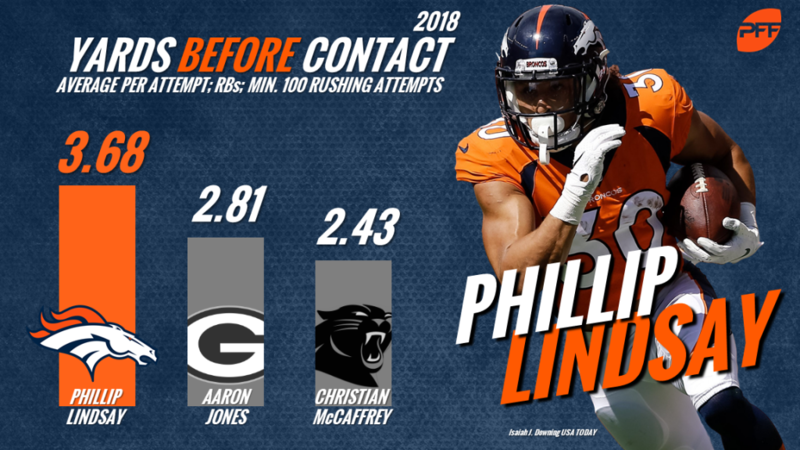 He also ranks 15th among CBs in yards allowed per coverage snap (0.85), and opposing QBs have just a 67.3 passer rating when targeting him in coverage. Out of 68 running backs who’ve logged at least 150 offensive snaps this season, Lindsay ranks sixth in terms of overall grade and fifth in rushing grade at 84.5. The undrafted rookie is tied for third among running backs with 28 rushes of at least 10 yards this season and ranks fourth among 35 backs who’ve seen at least 100 rush attempts this season by picking up either a first down or a touchdown on 27.0 percent of his carries. Out of the 139 receivers who’ve played at least 150 offensive snaps this season, Moore ranks tied for 15th in terms of overall grade, and he’s the only rookie receiver to rank within the top-35. Out of the 65 receivers who’ve been targeted at least 50 times this season, Moore ranks fourth with a 95.6 percent catch rate, and his average of 2.17 yards per route run ranks 14th among that group.